Which fragrance do you love the best, mung bean paste or coconut milk? Or if you love both of them for making traditional Chinese dessert or pastry, this is the recipe you’d definitely love to try. I made this mung bean filling for making some snow skin mooncakes last week. As you might’ve known that Mid-Autumn Festival (Mooncake Festival) is just around the corner. It falls on 30 Sept this year. This mung bean filling is perfect for being fillings of either traditional mooncakes or trendy snow skin ones. I'll post the snow skin mooncake recipe here very soon. Stay tuned. Rinse mung beans. Soak over night or at least 4 hours. 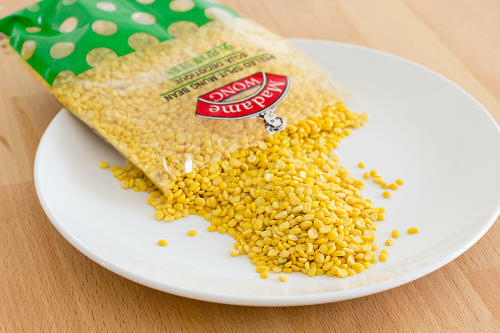 Transfer the mung beans into a large shallow pan. Cover the mung beans with boiling water with 1cm depth. (Note: The beans will continue to absorb as much as water along the way of cooking.) Steam in a wok over medium high heat, about 25 to 30 minutes, or until it’s easily smashed with your finger tips. Drain beans out and discard excess water. Use a large spoon to press through a fine sieve. You’ll get very smooth mung bean puree. 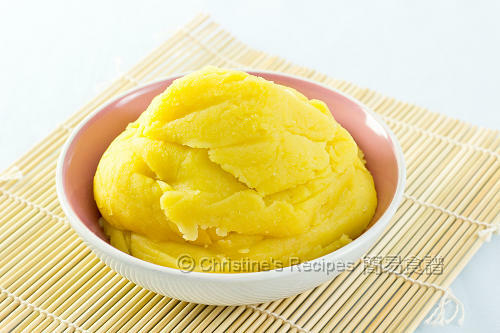 Transfer the puree into a non-stick frypan. Add sugar, coconut milk, oil and salt. Combine well. Cook over medium high heat until moisture is reduced by two-thirds. Sift in wheat flour in batches and stir to combine well between each addition. Reduce heat to low and simmer until thickened, stirring constantly, about 30 to 35 minutes. Transfer into a large bowl and let it cool down completely. Follow instructions of mooncake recipe to divide into portions, then shape into ball shapes. You can make mung bean filling one or two days ahead. Wrap it in plastic film and store in fridge. How can you tell if the mung beans are steamed enough? If it’s easily smashed with your finger tips, it’s softened enough. The best mung bean filling is not too dry or not too wet. 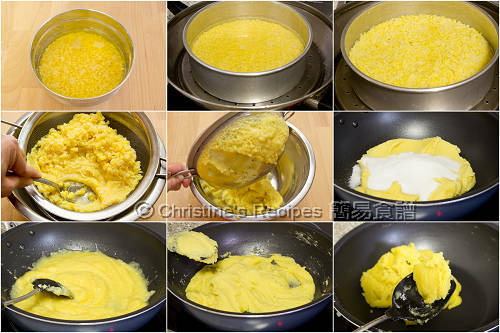 The texture should be like smooth dough, easily pulled away from pan (as shown in right bottom picture). Practice makes things perfect. You’ll get the hang of things after one or two trials. This mung bean filling looks very velvety and smooth. Nice! this so so yummy! I love mung beans, like those found in ang ku kueh (a traditional kueh dish here in Singapore). erm, just wondering, any way to replace coconut milk? will low fat milk work the same? Guess low fat milk will work too, although I haven't tried. It will give some milky taste. and glad to learn mung beans fillings,so I can expect more variety moon cake this year :-) thanks for sharing. Do you have a good "skin" recipe? The ones I've tried rise too much? How about this traditional mooncake recipe? I used this recipe to make some, very satisfied. You might like to keep an eye on your oven temperature. If the skin turns brown too quickly and puffed too high, that means the temperature is too high. I was confused about what is 澄粉, I searched many recipe on internet. some says it is wheat starch, some says wheat flour? are they really the same? I am very very new to cooking, sorry for the newbie question. Can i use Amaranth Flour and wheat flour as a subsitution? and is it any subsitution to glutinous rice flour? Yes, it's quite confusing. On my packet of 澄粉, written both english names as wheat flour and wheat starch. You might like to take a look at the picture on my Chinese blog here. The picture of 澄粉 is on the top right. 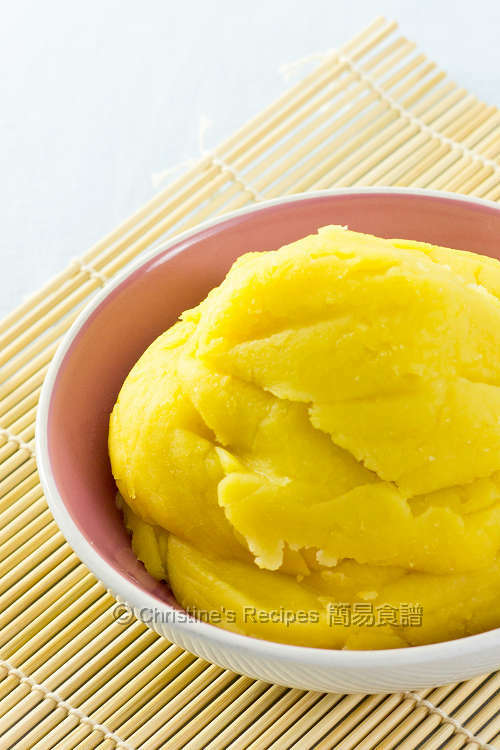 澄粉 is very different from glutinous rice flour and Amaranth Flour. Can't interchange. Beautiful mung bean paste. It looks really smooth. Love that you added coconut milk. I'm sure it gives the paste a lovely flavour, Must try that one day. Thanks very much for sharing. How long can we keep the filling for? Would we be able to keep it longer if we stored it in the freezer? Specifically if I made the fillings this week and stored it in the freezer, would I be able to use it to make mooncakes by the end of the month? This filling can be stored in fridge for up to 1 or 2 weeks. If skipping the coconut milk, it could be kept longer. If you keep it in a freezer, it can't be kept up to 3 to 4 weeks. I am going to try making this paste using ur wonderful recipe. You mentioned this paste can be used to make traditional mooncake too. Can this paste keep so long in the mooncakes at room temperature? This filling goes really well with the traditional mooncake skin. But the coconut milk won't keep so long at room temperature. So you have to consume it as soon as possible. We can't fight against the nature. But if you skip the coconut milk, the bean filling can be kept longer. Can you share a recipe for sweet black bean paste? I can't seem to find one anywhere online. Thanks! The texture will be slightly different. You might experiment with corn starch or tapioca starch though. Hello is it possible to freeze the mooncakes ? How long would they keep ? If ice-skin mooncakes, it should be kept in a freezer, can be up for weeks. But for the traditional mooncakes, I haven't tried to freeze them. Am afraid that the texture will be changed. Hello Christine I'm confused about how you cook the mung beans. Do you put them in a pan with water and then put the entire pan into the wok with the steamer? Can you describe how you do this? Thank you! The mung beans need to be steamed first and cooked through. Then it's turned into a wok to mix with sugar and dried it up until you get the right consistency. The mung beans is very nice smooth and soft, I like it... but how can it make harder. My girl is too soft... Thank you for your recipe I learn a lot from you. Simply cook away the moist inside it in a non-stick pan over medium low heat. When it dries up a bit, it will become thicker. If we do not have the wheat flour, can we use the glutinous rice flour? Another question is, we can only kept the paste in the fridge and not in the freezer? BTW, I bought two of your book. Will you be coming out with a third one. I haven't tested this recipe with glutinous rice flour. Am afraid that the filling will become a bit chewy if using glutinous rice flour. Thanks so much for your support of my cookbooks. At the moment, I don't have any plan on writing the third one yet. But if I do, I'll make an announcement on this blog. Hi, do u have snowskin mooncake recipe? Got some mooncake recipes, including snowshin mooncakes here. Sure, you can freeze the mung bean paste. It'll be kept longer in a freezer.